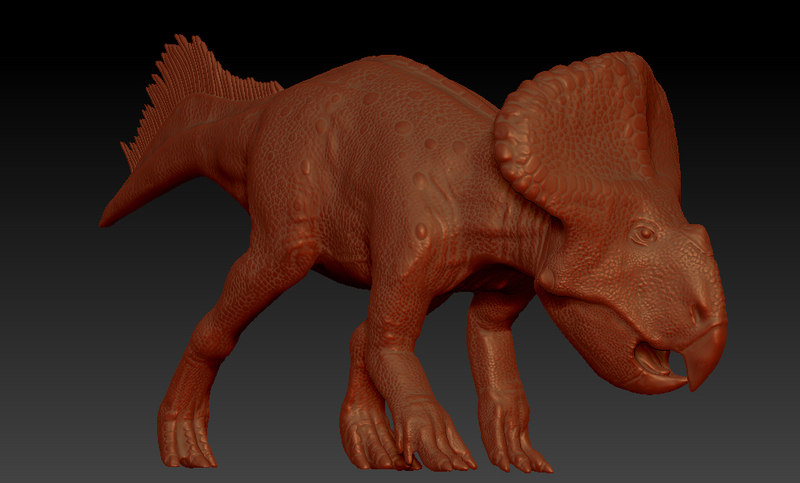 After playing around with Blender and ZBrush, I wanted to introduce you to my WIP Protoceratops. It's my first attempt and I'm preparing it right now for 3D printing (the details need to be adjusted to keep a lot of printability). Now I'm still interested in your opinion. Are there things I overlook or are completely wrong (from a scientific point of view)? As far as I'm concerned, I think it's a paleoartistic representation of the protoceratops genius. I do not understand paleontology but it looks very good. By the way, what material are you going to make this kind of ceraptoside? I mention it to you because I'm interested in PVC or vinyl figures. Mostly, it looks pretty good to me! You might consider changing the orientation of the hands, they should be rotated more outward than forward. Note in particular the right hand in this reconstruction. It may help to think of ceratopsids as bipedal dinosaurs which sort of haphazardly became quadrupedal. With this in mind, it might also be worthwhile to bulk up the hindlimb musculature in your model, particularly the calves. Talking of hindlimbs, the amazingly well-reasoned reconstruction of Psittacosaurus by Bob Nichols includes hindlimb patagia, soft tissue membranes, observed in at least one fossil specimen. This might be something to think about including in some way, too, since the two animals are reasonably close relatives. wonderful work. i agree with the post above. the wrist and hands should be facing more outward. and the calves can certainly benefit from a bit more girth. otherwise an amazing reconstruction of the beast. Thank you @Patrx for this in-depth analysis. I have seen the hand position in most reconstructions but for some reason I completely ignored this fact. This may also explain why I had so many problems placing the hands properly without breaking bones. @DinoToyCollector Well then you have a secure buyer. I might also be interested. Depending on the scale it would definitely look good alongside my immense accumulation of Velociraptors. Thank you Patrx for this in-depth analysis. You bet! I quite like little ceratopsians like Protoceratops. Depending upon what happens with this model, I'd potentially be interested in collecting a copy myself. I'm interested in the protoceratops you have in the @DinoToyCollector project. The UKRD and those of Safari still seem insufficient in my collection considering that it is one of the best known dinosaurs in the paleontological record and most importantly, unfortunately very little represented in the toy market "the sheep of the Cretaceous" should be better represented is a dinosaur that is needed to be done justice for its importance in the history of the Science of Paleontology. I tried to implement the suggestions for improvement. The hands now look much more natural. From this perspective maybe a bit clunky. Thanks again for the hint @Patrx ! I am already negotiating on which conditions the figure can be created. There are already offers that satisfy me. The figure will be made of soft plastic (PVC) and will be fully painted and conform to CE standards. If everything goes well with this figure, then there will definitely be more to follow. I would like to make models that are accessible to everyone. Especially the protoceratops, as @Shonisaurus mentioned, needs more presence among the toy figures. The hands definitely look better like this, but I'd suggest putting some flesh/membrane round the outer digits. They look a bit fragile and twig-like as they are. I'm excited with this protoceratops figure and also PVC! well painted can be your @DinoToyCollector works a serious competition to the rest of brands. We are living the golden age of the figures of dinosaurs and prehistoric toy animals. Before there were only a few companies that made prehistoric animals (at most three), now there is a huge variety. I hope you are lucky and you already know you have a safe buyer of your sculptures. I love prehistory. It looks all just fine to me. It's one of the best I've seen. However, the reference Patrx provided suggests a more alien like look, given that protoceratops have a ridiculously big head. Protoceratops actually had a relatively massive skull compared to the rest of the skeleton. But when the "standard" soft tissue is added to the skeleton, the relation of the size of the skull quickly changes to this of the rest of the body. -how big it will be? -what paint scheme are you thinking to use for it? If it will be a bit bigger than the Schleich Animantarx I’ll certainly get it! From what I see it will be the best Protoceratops toy ever made. I usually think that in this is a bad year to produce a ceratopsian with the advent of the BotM line, but this Protoceratops for me it’s the only ceratopsian toy better than the BotM one, at least looking at the concept art of the latter. I'm still working on the color scheme. I'm experimenting with three colors, but I'm far from satisfied (but I like the head). see below. I also like to receive suggestions on the colors. I (We, to be exact) want to focus on one scale at the beginning. This scale is 1:35. Not 1:40 and not bigger. That is, the Protoceratops is comparable in size to the ... Rebor Triceratops Hazelnut or more precisely: about 7cm or 2+3/4 inch. 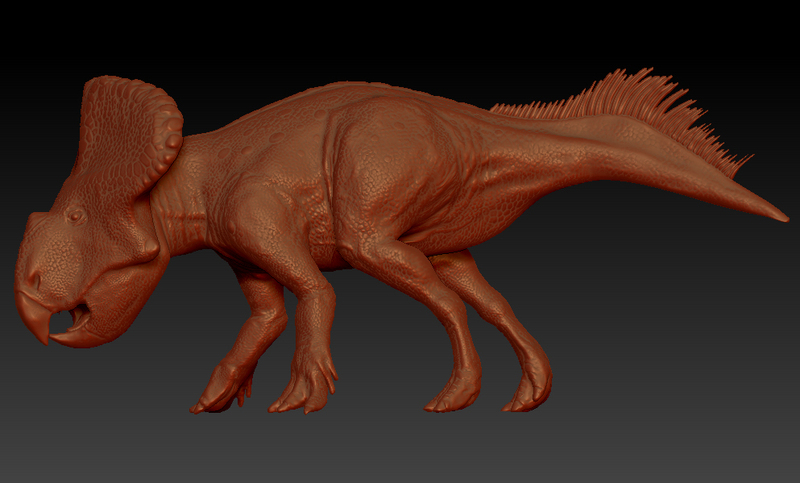 Why a protoceratops in 1:35? First reason: there are too few small species that are represented on this scale. The scale 1:35 offers the possibility to represent many different species in a uniform way, from very small to quite large. So far, a lover can have such figures made or ordered via 3D printing services, but the price often deters many, and these are also without painting. 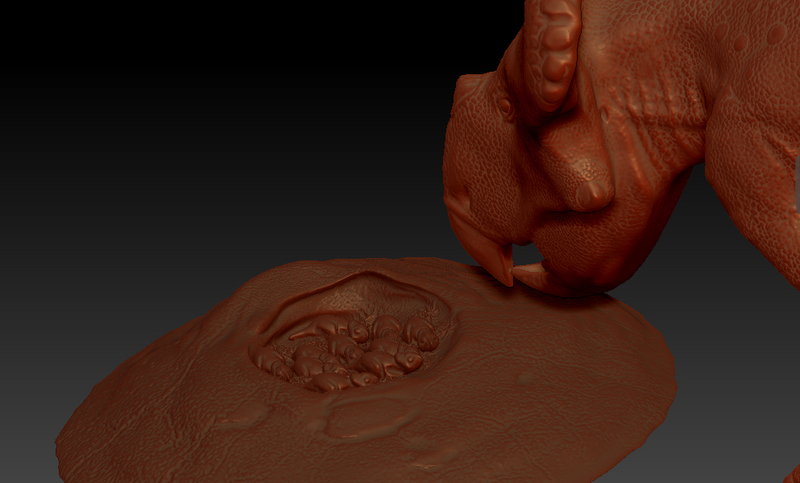 The Protoceratops will be among the smallest figures in the pipeline. Financially, this figure is certainly not very profitable and is more of an introduction to this business and I have learned a lot lately. If everything goes well, I'm looking forward to the upcoming models. Since I will initially only produce a few pieces for financial security, the price per figure will initially be comparable to those of Rebor's smallest figures. Since there are many interesting dinosaur species that are much smaller than a Protoceratops, I can well imagine to make another uniform scale for these figures, of which this protoceratops figure would be the greatest ... But let's start with this one figure and then see how it goes on. 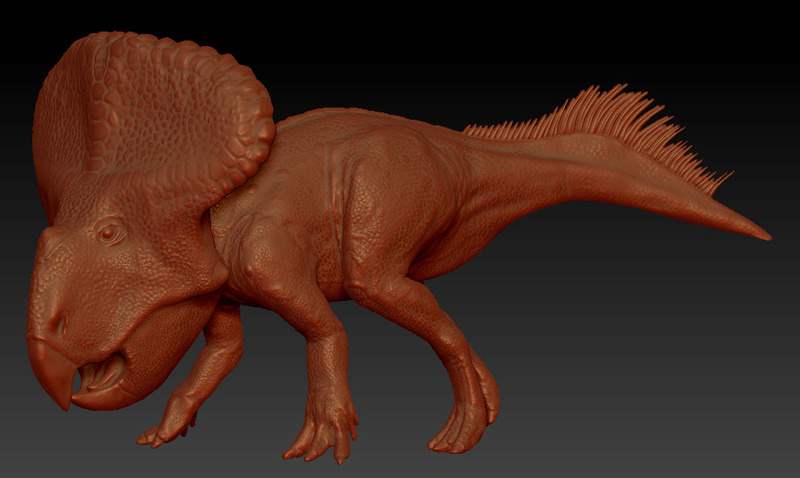 Maybe i will release this Protoceratops in a larger scale by popular demand. You can have the conviction that I will be a safe buyer. 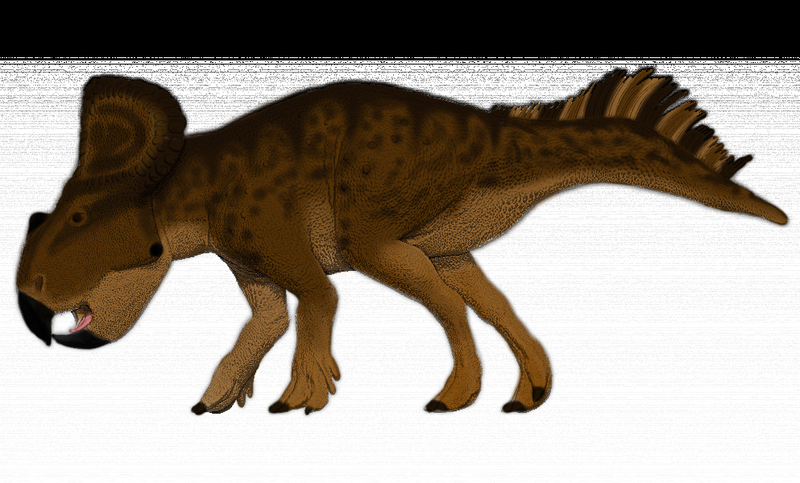 On the other hand I celebrate that it is a protoceratops on a smaller scale like the triceratops Rebor breeding. I understand that you have to first look for yourself and if it is profitable to market these products, you should not risk money and it is better as you say first experiment if those figures are sold and then perhaps make a bigger figure of protoceratops. Totally agree with you. On the other hand if you sell that figure, I would beg you to send me a PM to reserve it. PVC figures of dinosaurs are for me the coolest of the market and I celebrate that you want to make dinosaur figures with that material. About the color scheme, I personally think that the best of the 3 color schemes is the first. It has a cleaner paint job, which is better looking especially considering the small size of the figure. I understand your choice of making a mini figure, although I’m not really fond of it. Maybe I’ll buy one anyway, maybe not, it all depends from the price. Anyways I can’t wait to see what you’ll do next. I like the idea of a truly tiny Protoceratops! Hasn't been one since the old Carnegie model with nest.